The Beocord VX 5000 was B&O’s first model in a new and long-running series of top-line machines. Conceptually, it differed greatly from what had come before, for though it was completely manufactured by Hitachi in Japan, it was designed by B&O and all the parts and assemblies were unique to B&O. There was no equivalent model in any other manufacturer’s range, unlike previous Beocord video recorders. Because B&O had designed and specified everything themselves, the Beocord VX 5000 could be made wide and slim, in classic B&O proportions, and could be finely detailed and generously specified. Text copyright © Beocentral. Unauthorised reproduction prohibited. The basic specification included stereo Hi-Fi sound recording (along with normal sound recording in mono), 3 video heads (offering “perfect” still and variable slow motion modes), video and audio overdubbing functions, half-speed audio-only recording, index search, electronic tuner, HQ video recording and complete control of all functions via an on screen display interface and a Beolink 1000. The VX 5000 was designed for use with the LX and MX Beovision range, and included no infra-red remote control sensor. Instead, software in the television passed the relevant control signals to the video recorder. This new level of integration considerably eased operation by remote control compared to the previous generation of models. For owners of older Beovision sets, a Beolink 1000 and a VX sensor IR receiver could be bought separately, so the VX 5000 could be used as a normal remote controlled video recorder. Later versions had special software that allowed the video recorder to download the tuning data from a suitable Beovision TV set. The video recorder could recognise such a set automatically, and to indicate that the tuning had been performed in this manner the “tuning” option was removed from the on screen menu. Text copyright © Beocentral. Unauthorised reproduction prohibited. Perhaps the most advanced technical feature of the VX 5000 was the digital video effects unit. This very complex section of the machine was in effect a video digitiser and framestore memory. The extra features made possible by this included a “freeze frame” pause function of off-air (live) TV, the ability to view 4, 9 or 16 TV channels at the same time, picture in picture (either from off-air TV and the tape or from two off-air TV channels), the ability to create a frame-by-frame page (either from the tape or TV) of paused action and perhaps most usefully, a visual tape index. This last function used the index search system to scan that tape, and store a frame from each recording that was found. Finally, the tape was automatically rewound and the page of pictures recorded on the first 10 seconds. Thus, when the tape was inserted, all the programmes on it were visible. All that the user then had to do to select one is to press the number next to it on the Beolink 1000, and the VX 5000 would locate the recording and play it. This function was unique to the VX 5000, no other video recorder offered anything similar. The tapes, once prepared, could be used in the same way in any other video recorder that was fitted with index search. Text copyright © Beocentral. Unauthorised reproduction prohibited. When launched, the Beocord VX 5000 was not fitted with a Nicam decoder. After a short while, one was made available for fitting by B&O dealers, and a version of the UK market model was introduced with one already fitted. Text copyright © Beocentral. Unauthorised reproduction prohibited. 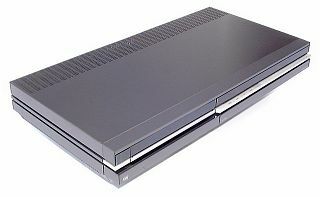 Whilst the VX 5000 was designed for use by remote control, the tape transport controls were duplicated on the front of the machine (with the omission of pause and picture search). Under a hinged cover below these keys there were controls for less frequently used functions, such as source selection, dubbing, HQ and an “E240” mode for the real time tape counter. There were also sliders to control the recording level during audio-only recording and for headphone volume. Text copyright © Beocentral. Unauthorised reproduction prohibited. Complex and well made, the VX 5000 was always an expensive machine. The level of complexity was such that the launch of the machine was delayed whilst the finer points were perfected, though when it finally did go on sale it sold well. Despite this, the VX 5500 which replaced it was made very much simpler. Text copyright © Beocentral. Unauthorised reproduction prohibited.